You have a business and a fantastic product or service. But, now you have to engage in one of the most essential activities to build your business—attracting potential customers. Even if you already have customers, to keep the business going and growing, attracting even more customers should be an ongoing effort. To do that, you need to have a unique point of view, and give customers a compelling reason to communicate with you. While every business is different, marketing remains necessary for every one. Ideally, you should be using multiple channels to find and attract customers. So, as a supplement (for larger businesses) or an alternative (for smaller businesses) to traditional marketing efforts like print or television media, think about using promotional products. When it comes to advertising, over time, the attention span of customers has become shorter and shorter, making it even more difficult for businesses to build their brands. In turn, businesses have to think outside the box to garner customers. What better way to literally do that than with custom promotional products? Since it’s summer, customers can take your brand outdoors with unique custom outdoor products. Instead of simply telling customers how wonderful you are, listen for what they really want, and then satisfy that want. At this time of the year, customers are spending more time outdoors with friends and family, hosting parties, having picnics or just relaxing. For these reasons, providing customers with promo items like custom coolers is a good incentive for them to conduct business with you. Your company logo or contact information can easily be printed onto these custom coolers, which makes it really simple to take an ordinary cooler, and turn it into an effective advertising tool. Our selection of promotional coolers come in various sizes and colors designed with the customer in mind, like the Collapsible Party Cooler, which can securely hold a whopping 28 beverage cans and even comes with a retractable bottle opener! Once customers have coolers packed with cold drinks close by, they will need somewhere comfortable to sit back and relax. Whether it’s at a concert, a sporting event, or just to soak up some sun, a custom promotional chair is the perfect seat. By providing customers an enjoyable day outside, your brand can enjoy greater visibility, and in turn, you will expand your audience. Custom printing a swag item like the Fanatic Event Folding Chair with your corporate logo will surely help your brand stand out in the crowd. This chair also conveniently has built-in cup holders and even a matching carrying case. After chilling out with a refreshing beverage for a bit, customers have picked up the pep to play some sports and games. We’ve got custom sports products to equip the athletes and the cheering section too, from soccer balls to golf tees to face paint and more. These offer wonderful branding opportunities that really allow your brand to be seen on a larger scale, regardless of how small your business may be. 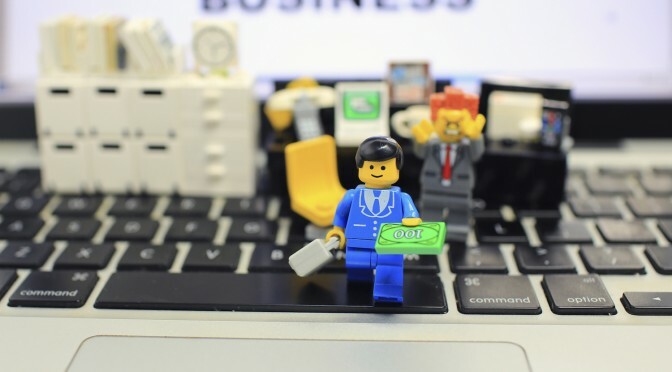 You can really get more bang for your buck, especially since unique branded swag makes a statement and illustrates your brand personality without having to spend a lot of money. Take a look at this handy Stake Your Spot Kit for a great golf game, and imagine seeing your brand front and center and having your message heard loud and clear. 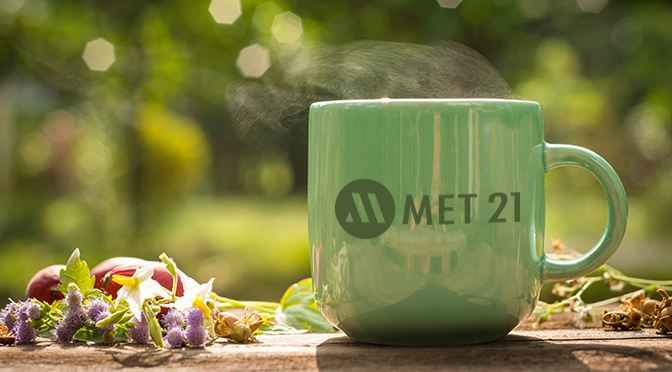 Custom outdoor promotional products will freshen up your marketing strategy in a way that makes your products, services AND your brand message resonate with customers. Because at the end of the day, if you want to get the attention of your customers, you have to give it to them first. Licking sweet popsicles, going for a dip in the swimming pool, lazing in a hammock. Many consider these just a few of the ingredients for a perfect summer – us included. What you may not know about the summertime months, however, is that a little creative marketing can help you incorporate your brand into the summer mix. Customers tend to have a soft spot for brands that reward them for their support, and at the same time, show some personality. Custom products are a unique means to do precisely that. Good music can make a summertime picnic or a relaxing beach day even better, and this waterproof speaker can really turn up on the volume on some serious outdoor fun. This bluetooth speaker allows your customers to hear their favorite music from their mobile devices amplified to an even better quality. They can kick back with up to four hours of high quality, uninterrupted play, and then they can easily recharge within 2 hours using the provided micro/USB cable. Moisture doesn’t have to put a damper on the party, because the speaker will still work regardless of the external condition, and as an added bonus, this custom speaker comes equipped with a removable carabineer and a compact carrying case. With all of these unique features that already impress customers, the only thing that you could do to make it even better is to remind them who is making it all possible – your brand! By laser engraving or pad printing your logo on the front of this promotional speaker, you’ll definitely be turning up the dial on some serious brand recognition. There’s nothing quite as refreshing as sipping ice cold drinks on a sizzling summer day. For that reason, customers will be pleased to receive this daypack picnic custom cooler, which makes chilled beverages accessible in any given moment. The cooler is made of 600d polyester and an insulated leak-proof liner – keeping messes and spills to a minimum. Other additional accessories like a wooden cutting board knife and a bottle opener are also included, ensuring that eating and drinking on the go is never a cumbersome task. Considering how versatile this product is, it just needs one last finishing touch – your corporate logo. Each time a customer uses your efficient custom cooler, that person will immediately be reminded of the high quality that you and your brand represent. With a frosty drink in hand and good music playing, customers need a comfortable way to enjoy the sunny weather AND stay cool at the same time. This fun, floppy hat will really do the trick. Both functional and fashion forward, this cozy hat comes in 2 simple colors to suit any customer’s style sense. It’s simple to adjust with the removable, 2-inch, 100% cotton band and hook and loop closure. With this hat in the hands of your customers and your corporate logo attractively embroidered on the front of it, they’ll be making a fashion statement while you make a brand statement. It’s a win-win! Making the most of beautiful summer weather is something that’s very near and dear to customers, and they’ll be more inclined to follow your brand if you can show them how your brand takes their entire summer experience into consideration. Get your logo custom printed onto a few custom summer products for a brand that shines with all its summertime strength! According to recent studies and surveys, most consumers believe that brands have the opportunity to improve quality of life and wellbeing, but are failing to do so. Those same studies also showed that most consumers had admitted to the fact that they wouldn’t care if over 73% of big brands were eradicated entirely. Those numbers are staggering, and quite frankly – they’re scary. In this day and age, being a health-conscious brand is more important than ever, which is why your business should be investing in promotional products like custom BPA-free water bottles. BPA is short for Bisphenol-A, and it’s an industrial chemical commonly found in the plastics that are used to make many food and beverage containers. As a result, BPA may be able to seep into the food and drinks we consume, and it can have adverse effects on health if consumed at high levels. By getting your logo custom printed onto custom BPA-free water bottles, you’re doing so much more than gaining brand exposure – you’re also proving to your consumers that your brand cares about their wellbeing. As audiences are growing more and more concerned with personal health, choosing custom promotional BPA-free products could very well put you over the competition. The popular choice among our customers and their customers, the Poly-clean 28 ounce BPA-free bottle makes your brand instantly accessible to a broad market. Its efficiency and portability makes this promotional bottle adaptable to any lifestyle, while the sleek, translucent design, leak-resistant lid, and lead-free feature give it some extra charm. Pick from nine bright colors of custom bottles, imprint your logo, and before you know it, you’ll be on your way to building a health-conscious brand! 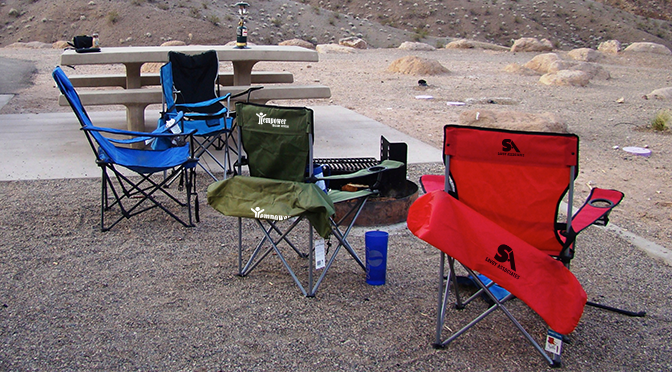 You can see why our staff raves about the Eco-Safe 24 oz. custom water bottle. In addition to the convenience of being a beverage container, it’s also BPA-free and made of completely recycled materials. It’s reassuring to your consumers to know that your brand is concerned about their wellbeing and is essentially improving their quality of life. The straightforward and clean design of this custom water bottle makes it a cinch to clearly display your branding – so you’ll be making impressions with every sip! This 26 oz. stainless steel custom BPA-free water bottle is a solid choice for getting your brand message in front of customers without all the noise. The screw top lid with handle allows it to be easily transported – without all the bulk – and getting your logo screen printed the stainless steel material gives off a polished look and feel. Enjoy the benefit of reaching even more customers in a stylish, yet still health-minded manner. Custom BPA-free water bottles are a safe and practical way for customers to carry their beverages (and your brand) wherever they may go. With custom promotional BPA-free water bottles, you can stand out in a saturated marketplace, drum up new business without expensive advertising, and retain your current customers. Get your brand on that BPA-free bandwagon! You may not give a second thought to the average umbrella, however, with some embellishment – and a little bit of branding – you can turn a boring umbrella into an effective marketing machine! Custom umbrellas do so much more than just protect your clientele from the elements. They also serve as much-needed staples at company outings, as essential accessories for a few rounds on the golf course and as top real estate for gaining a little extra brand exposure. Getting your logo custom printed onto a promotional umbrella is a great way to (literally) get your brand above the heads of your competition, and your audience will thank you every time your branded umbrella keeps them dry, cool and so much more. One: Promotional umbrellas make a BIG statement. Unlike other promotional products, the sheer size of custom umbrellas provides massive space for applying your branding. This extra space allows you the freedom to fully customize your umbrella with your brand, logo or company message, and it’s certainly a bold and easy way to stand out in a sea of traditional advertising. Promotional umbrellas provide an opportunity to unobtrusively get your brand into the lives of your customers in a meaningful and useful way. You don’t need to be a promotional expert to see how your brand can make a big statement with custom-printed promotional umbrellas. Try something like this 60″ Promotional Golf Umbrella for your next outdoor event and more! Two: Promotional umbrellas have higher visibility than other promotional items. 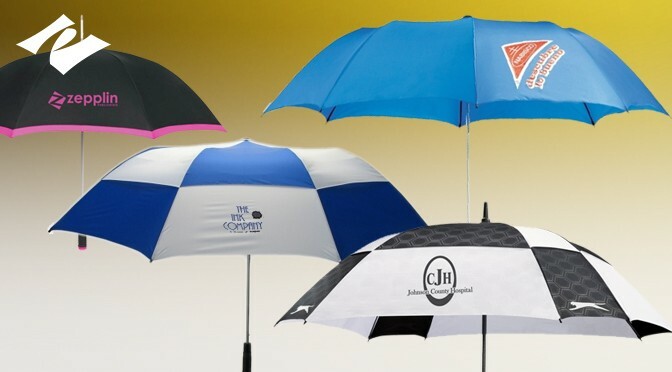 As stated before, promotional umbrellas have an advantage above other promotional products due to their sheer size and availability for branding. They are large platforms for advertising your logo, and they send a branded message that won’t soon be forgotten. Come rain or shine, custom umbrellas are perfect for gaining brand exposure and recognition. Snag a custom umbrella like this 68″ Arc Vented Windproof and nothing will be able to rain on your parade. Three: Your brand and marketing message lasts longer with custom umbrellas. Promotional items like custom umbrellas are sure to be used time and time again, ensuring that your brand resonates with customers over a long period of time. This, in addition to the umbrella’s portability, gives you ample opportunity to effectively gain the brand exposure you hope to acquire. Everyone from the on-the-go businessman to the avid camper will be seeing and using your logoed umbrella, and they’ll be resonating with your brand every time they do. This 37″ Promotional Umbrella with a handy travel case is perfect for a little on-the-go brand promotion. With promotional umbrellas, you can inspire customers to interact with your brand, and you’ll be establishing a long-lasting relationship with them. Your recipients will be carrying your message with them everywhere they go, ensuring your brand and logo will be gaining exposure with audiences across the board. Be sure to take advantage of the immense branding opportunity that comes with getting your logo custom printed onto promotional umbrellas. It’s sure to be a forecast for marketing success! If you visit your nearest golf course, you’ll more than likely find ladies and gentlemen clad in golf polos and shorts, fancy socks and shoes, and much more. On the back of their golf cart, you’ll find bags full of golf balls, golf clubs, golf tees, towels and everything else you could imagine for a day well spent on the course. And what does this mean? This means that getting your logo on even just a few of those products can easily and effectively build your following and boost your brand awareness. And with the rise in popularity for the game of golf, promotional golf products have rapidly become more important and more effective than ever. Think about it – Next time your clients tee up, they could be using the promotional golf tee that you provided them. They could be standing under your custom umbrella to avoid the heat of the sun, and they could even be hitting your very own logoed golf balls. Basically, the opportunity for brand exposure is endless here, and your customers will be keen to hit the greens when provided with promotional golf products that can help up their game. Whether your customers are golf enthusiasts or novices to the game, these high-performance branded golf balls are items that will see long-term use. The softer coating and lighter core of these promotional Nike RZN golf balls enhances the ease of play, and their efficiency will ensure your logo stays in the minds of your customers with every swing. Pair this promotional golf ball with your brand for a winning marketing game. Promoting your brand will (literally) be a cinch when you have the Golf Ball Promotional Cinch Pack in your marketing arsenal. Set your customers up for success on the golf course with this twist on the traditional promotional drawstring bag. Not only is this bag a compact way to carry items, but it’s also amusingly shaped like a golf ball. Get your logo screen-printed onto this promotional golf bag to start making impressions across golf courses everywhere! There won’t be any raining on your (golf) parade with this promotional umbrella on your side. The reinforced fiberglass frame makes this promotional umbrella lightweight, while the canopy allows it to withstand strong winds. Golfers and non-golfers alike can benefit from using this custom umbrella, and your brand will be making impressions every time they do. Your brand and your customers will really hit it off when you provide them with these promotional golf tees. Carefully created with golfers in mind, these custom golf tees allow for ample opportunity for branding with 8 different color selections and several different imprint methods. Get your logo screen-sprinted on one of these promotional golf tees for optimal brand exposure and impressions. Promotional golf products are creative ways to reach your customers, regardless of whether or not they’re golf newbies, long-time players, or lifelong lovers of the sport. Check out the custom golf products offered here at Pinnacle Promotions and start upping your branding game. As we say goodbye to 2014, we want to take a look back at some of Pinnacle’s top moments of 2014. Pinnacle Promotions celebrated our 20th birthday in July. We hosted a company celebration replete with songs, and food, and fun. After 10 years in our previous location, we moved to a new, spectacular office space in February. We had to work around some pretty major weather delays, but eventually we arrived at our new digs with our pink crates and worked quickly to get settled in! Pinnacle Promotions Do Good Feel Good committee chose a foster family to adopt for the holidays. Our team shopped for Barbies and pjs and makeup for two sisters taken in with nothing but the clothes on their back just before the holidays. How fun it was to make a difference in the lives of these young ladies. Pinnacle team members donated more than $500 in gifts and gift cards for this family and these girls. For the fifth year, Pinnacle Promotions is named to ASI Counselor Magazine’s Best Places to Work. The family culture, continuing education training and career pathways, and flexible work schedules all contributed to the recognition in 2014. January 3rd, 2014, Pinnacle introduced our new brand to the world in a huge unveiling! Pinnacle hosted our first-ever Atlanta Idea Expo ’14. The event happened on September 17th, and was the first of its kind for Pinnacle. We invited area clients, and some clients from farther away, to spend the day at our new offices with vendors, free samples and a delicious lunch. In May, to match our new branding, Pinnacle launched our totally re-vamped website. PPAI, the national non-profit association for the promotional products industry, selected Pinnacle Promotions as a finalist for four awards: Image Awards – Branding, Image Award – Distributor Catalog, Image Award Technology Award – Ecommerce website, Technology Award – Social Media, Technology Award. Trustpilot is an online-review platform for ecommerce businesses. Trustpilot boasts more than 7.5 million reviews on its site, representing businesses in more than 16 countries. Pinnacle Promotions uses Trustpilot for its customer review program. And, we were so very proud to accept the first-ever Trustpilot Customer Milestone Award. In July, Trustpilot recognized Pinnacle Promotions for collecting more than 500 reviews. Of those reviews, the majority are five-stars. Counselor Magazine’s Andy Cohen, Mindy Jensen Ligos and C.J. Mittica stopped by Pinnacle Promotions to check out the new offices during the Counselor Magazine Best Places to Work Road Trip. Each year, our team members join Emory University (we are alumni, they are a client) for their annual fundraising 5K race. Pinnacle makes the Inc. 5000 list of Fastest Growing companies in 2014. The snow and ice storm that hit Atlanta in January and February not only shut down most of Georgia, but also slowed our office move. On the bright side, this past year we initiated an “always on” connection plan so that our offices are never really closed, moving forward. 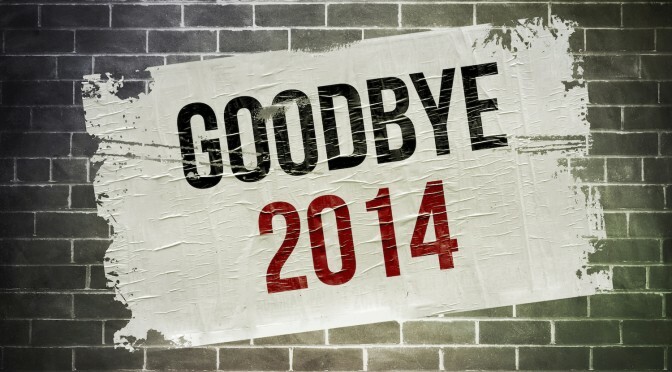 We can’t wait to see what 2015 brings to Pinnacle Promotions, and to all of you! Hush Puppies was looking to increase sales of Hush Puppies shoes in the Fall for their WeatherSmart campaign and in the Spring for their Commuter campaign using a gift with purchase. The Pinnacle programs team worked closely with the fabulous group at Hush Puppies to develop just the right products to help Hush Puppies make the right impression with their value-added items. The long, storied history of innovation at Hush Puppies set the bar high for quality and unique product offerings! Pinnacle provided our client with IdeaKits featuring product ideas that would speak to the campaign messages. • For WeatherSmart Campaign, we designed a fashion-forward folding umbrella that would appeal to the retail distribution channel. 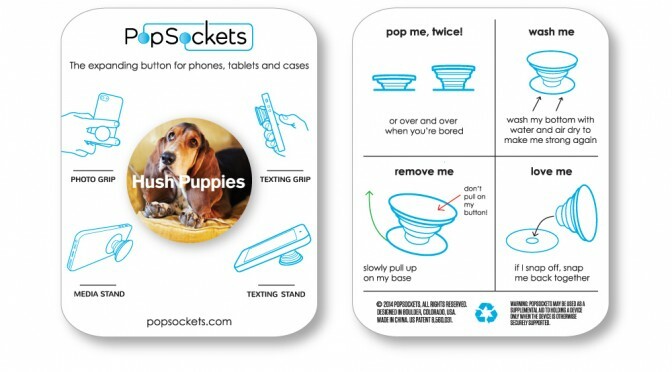 • For Commuter Campaign, we designed a fashion-forward keychain and introduced a clever, new & unique product called the PopSockets(R) for a mobile technology accessory. Pinnacle managed the production and distribution of these 2 campaigns to Hush Puppies’s nationwide retail channels. We also held available leftover inventory on these items that we then re-purposed for Dealer Incentives (WeatherSmart) and to tie into a Social Media Campaign Giveaways (Commuter). Pinnacle not only was able to manage and execute the projects successfully for the US, but also for the UK and Canada markets. In addition the retail partners responsible were very impressed with the drive in sales and appreciated we were able to integrate into their distribution network without any hassles. Gas grill or charcoal grill? Group section seating or corporate suite? Corporate picnics were good in the summer, but this is football season! And, it is football-tailgating season. 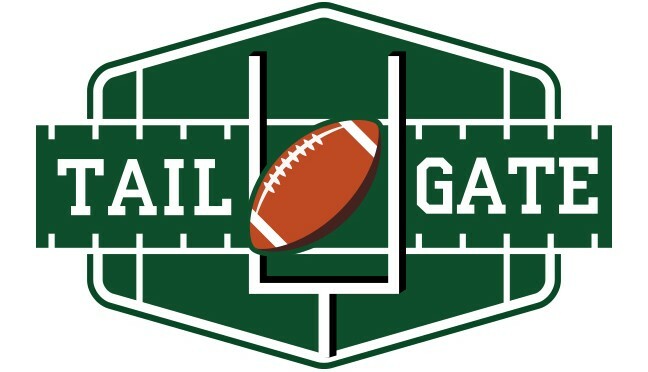 So no matter what team your organization roots for, tailgating and attending a fall football game is always a fun corporate event and great for team building…as long as your team wins! 1. Keep the drinks cold! 2. Clean up after yourself! 4. Keep the fans warm! Check out our Pinterest boards for tailgating: Top Picks for the Total Tailgating Party and Megan’s Tailgating Must Haves for 2014. We want to see your pictures! If your organization does some tailgating this season, share your pics with us of your team supporting your team! Post them to our Facebook wall. This is just one of the quotes from people who attended Pinnacle Promotions Atlanta Idea Expo ’14. The event happened on September 17th, and was the first of its kind for Pinnacle. We invited area clients, and some clients from farther away, to spend the day at our new offices. We invited 12 vendors to bring their best presentations, samples and ideas to share with our customers. Guests moved through the offices with a passport, showing destinations and directions for experiencing what each vendor had to offer. At the end of the day, we invited our guests to sign the back of their passport and drop it in a drawing for an iPad. Just for attending, guests were entered to win any number of prizes throughout the day including compu-backpacks, men’s and women’s all-weather apparel and even a golf bag. Throughout the day, guests were welcome to stop at any one of the five educational sessions. Session topics included Holiday Gifts, Apparel, Case Studies, Company Stores and Social Media. The Apparel and Social Media sessions proved to be the most popular among the attendees. Ideas were flowing fast and fierce! Guests left Pinnacle with goody bags full of samples and new information about smart products that they can use to promote their brand. They were able to complete sample request cards to get specific samples sent to them at their office for a closer look. They were able to leave with the experience of having spent the day with their co-workers or Pinnacle account teams. 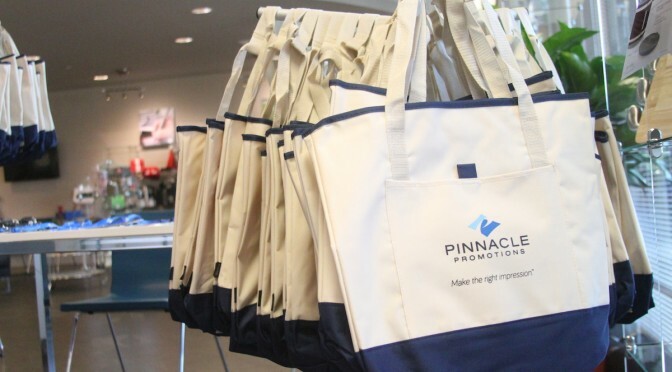 And, they were able to leave Pinnacle Promotions with sneak peeks into what promotional items are new and unique for 2015 as well as great ideas for ways to use popular branded items to gear up their team, reward employees or expand their audience. Click to see more pictures from our event. If you attended the event at our offices, please stop by our Google+ local page and leave a review about your experience! And, stay tuned for news and information about our next great event!